Research papers on Martin Luther examine one of the most important figures in Christianity. Important religious figures such as Martin Luther can be studied in a religion research paper. You give our writer the details on Luther that you need focused on and our writer will write your research paper exactly as you outline it. Martin Luther (1483-1546) is one of the most important figures in Christianity, leading the Protestant Reformation that broke the universal hegemony of the Roman Catholic Church over the lives of Europeans. A monk and professor of theology at the University of Wittenberg, in modern Germany, Luther’s 95 thesis sent shockwaves throughout European history, in many ways inaugurating the modern world out of the medieval. On October 31, 1517, Martin Luther nailed his thesis to the door of All Saints’ Church, hoping to initiate a debate over the sale of indulgences. Johann Tetzel had been sent to Germany in order to raise funds for the construction of St. Peter’s in Rome, and Luther objected to this practice. Printed versions circulated throughout Europe, and eventually Luther was called to task for his beliefs at the Diet of Worms. It was there that Luther made his stand, refusing to submit. In founding Protestantism, Luther sought to reform the Church, ending abuses and preaching the doctrine of justification by faith alone. During his stay at Wartburg Castle, Luther translated the Bible in to German, an act that helped spread literacy. By 1526, he was organizing his new church in Wittenberg, moving into a former monastery with his wife and six children. 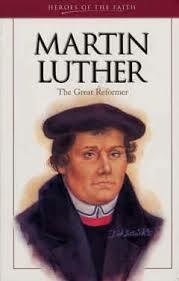 Martin Luther continued to write and preach the foundational doctrines of Lutheranism. He died in 1546, and the split he wrought between Protestants and Catholics would erupt into the Thirty Years’ War. It is unlikely that a single priest such as Martin Luther would have initiated the changes that occurred without the full support and encouragement of the people. Most likely, Luther became the instrument of the people who desired many changes within the way that they were being ruled. Luther also saw himself as an instrument of the people for he felt “indignant that the people of Christ” (in Concerning Christian Liberty) were being treated so poorly by the church and the state. first of all, the gospel does not cause rebellions and uproars, because it tells of Christ, the promised Messiah, whose words and life teach nothing but love, peace, patience, and unity. And all who believe in this Christ become loving, peaceful, patient, and one in spirit. This is the basis of all the articles of the peasants …: to hear the gospel and to live according. “The Twelve Articles” then continue to demand such items as tax relief, changes in governmental rule within the community, and power with regard to selecting and dismissing pastors that serve the community church. Interestingly, Bickle notes that “during the Reformation peasants attempt to make the church conform to these communal structures”. Consequently, the interest of the peasants lies in relief from the domineering and demanding church. Luther points out that freedom of the physical body is not worth anything without freedom of the soul. Luther writes, “What can it profit the soul that the body should be in good condition, free, and full of life; that it should eat, drink, and act according to its pleasure; when even the most impious slaves of every kind of vice are prosperous in these matters?”. The peasants and Luther wanted accountability in the church and leaders of the state. In as far as revolt is concerned, the peasants used Luther as a tool of their revolt. This is not to say that the peasants were not interested in Christian issues, but they appear to be secondary to the issues of governing with the community. In fact, the peasants’ interest within the church was such that Bickle suggests that one of the critical difficulties with church doctrine for the peasants was that it made the common people mere “subjects” of the priest, rather than “partners of the priest”. This communal reformation with regard to the interactions begins prior to the Reformation and reaches its height when the Reformation is beginning. This would indicate that the Reformation was a reaction to the changes that had already taken place with regard to the social revolution that occurs. Protestant Reformation - Martin Luther was a German monk who, in 1517, published his Ninety-Five Theses, which criticized the Catholic Church's sale of indulgences and other abuses. The Roman Catholic Church - The Roman Catholic Church is the movement in the Catholic Church that followed the Protestant Reformation and therefore is often called the Counter Reformation. Catholic Church - Catholic Church research papers on religions around the world explore St. Augustine and his ideas on the Catholic Church. Religious Place of Worship - Religious Place of Worship Research Papers discuss a personal experience of a Roman Catholic Church, with details of the building and sermon. Roman Catholicism - Roman Catholicism refers to the dogma promulgated by the Roman Catholic Church, the largest Christian sect in the world. The Counter-Reformation - The Counter-Reformation within the Roman Catholic Church research papers discuss a brief history of the Protestant reaction. Catholic Family - Research Papers on the Catholic family tell what it is like to live in a Catholic family and grow up being Catholic. The Catholic Church and Nazi Germany - The role of church-state relations between the Roman Catholic Church and the international community during the period now referred to as the Holocaust. Paper Masters writes custom research papers on Martin Luther examine one of the most important figures in Christianity.